Visual / Sonic Art Events: A Promulgation of Adventures in Sight / Sound: Why the Compact Disc May Actually Sound Better than Vinyl: Are Audiophiles Hearing Something We're Not? Why the Compact Disc May Actually Sound Better than Vinyl: Are Audiophiles Hearing Something We're Not? There seems to be no shortage of mysticism centered around the resurgence of the phonograph record listening experience. By experience, I mean just that, the sensory engagement from the whole of the auditory, to visual, to textural, to graphic, to physical connection of the weight and handling of the object. All of these are a pleasure, no question. I myself am a vinyl advocate and have had a higher-end turntable in my home stereo setup for almost 20 years. That said, there's a very literal and scientific difference between the nature of the turntable's representation of an analog signal to that of a Digital to Analog Converter and how these devices define that information, which is then sent to the amplifier to be broadcast by the speakers. 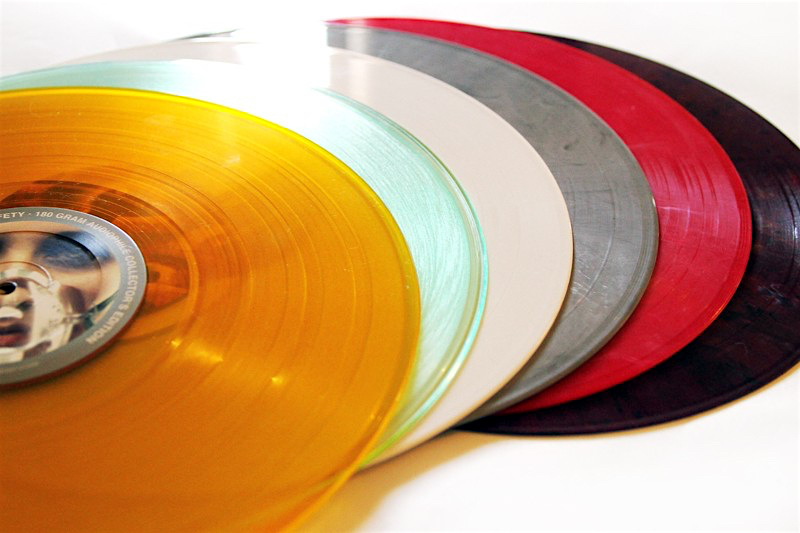 So, as much as I might derive amusement from pieces like, the Detroit Metro Times' "Colored Vinyl is For Big, Spoiled Record Babies". It doesn't actually aide the discussion to simply call people out on their obsession with the appeal of "deluxe" limited editions and aesthetic appearances. Particularly while overlooking some of the deeper technical analysis of the playback process. In this we can thank Chris Cornelis' "Why The Compact Disc May Actually Sound Better Than Vinyl" for the LA Weekly, and the article's critical look at both vinyl and compact disc hardware and the mechanics of how each produces the reproduction of a musical recording. What we're often seeing described in people's preference for vinyl's analog representation of the recording are the additional auditory artifacts, namely distortion and pitch variation, that LP playback produces in the the listening experience. Ad to this the rounding off of frequency extremes, at both the high and lowest end of the frequency spectrum. These are in-part produced by the inconsistency of the available surface of the LP itself over the duration of it's playback and the stylus' mechanical traveling over the progressively reduced surface of the record, "The vinyl disc is a steadily collapsing medium," says Bob Ludwig, Grammy-winning mastering engineer with credits on Patti Smith's Horses, Steely Dan's Gaucho and Jack White's Lazaretto, among many others. "The closer it gets to the label, the more the information is getting compromised, the high frequencies getting lost." To address the question of taste, as some people prefer it, Gizmodo's "Why Vinyl Is the Only Worthwhile Way to Own Music", detailing the hows and whys, but it can't be said that vinyl is a more accurate or 'more genuine' representation of the recording. In fact the opposite is true. For the most accurate reproduction of a recording at the 21st century studio standard of a hi-bitrate 24-bit/192-khz sampling rate file, a quality DAC is the modern ideal. But this is often costly hardware and few people have had the foresight to convert, or purchase, their music collection as true high fidelity/high sampling rate files. For reference, the Rega Research DAC-R and Benchmark DAC2 HGC both reviewed favorably by those most rigorous of listeners, Stereophile Magazine will each run you, $1200-1995 respectively. Short of this solution, the Compact Disc is still probably the best budget answer to higher sound quality in a home playback system. Consistently, your average entry-level stereophile $300-350 CD player like the NAD C-516BEE will outperform, ie; more accurately represent, the same recording than a similarly priced turntable and cartridge setup. At that pricepoint, the best-of-the-best to be found in a turntable with the beginnings of stereophile engineering would be the award winning and critically hailed Pro-Ject Debut III and though an excellent budget turntable, it is outclassed by the C-516BEE on almost all fronts. To match the expressiveness, dynamic range, transparency and kind of realism heard in the playback of the NAD CD player mentioned above, you'd need to jump up to the $750-900 range of the excellent, Analog Source Component of the Year-winning, Rega Research RP3 or Music Hall MMF-5.1. There is also the option of finding a financial middle ground like the Rega Research RP1 or Music Hall MMF-2.2, either of which will deliver something approaching the fidelity of the NAD C-516 CD player, yet still fall short at a 25-30% price hike respectively. A majority of the people we might encounter are content with their thriftstore bought used turntable and vintage 1970's amp and speaker setup. And no question, these do the job of representing music and it's surface in a pleasing, room-filling sense. And depending on your ear, and experience, this could be absolutely satisfying. But then there's the opposite end of the spectrum. The almost equally mystical quest for total representational perfection to be had in the Audiophile pursuit. But even as Alexis Petridis asks "Audiophiles: Are They Hearing Something We're Not?" in the pages of Esquire, her experience plumbing the depths of fidelity mania, with all the absurd fanaticism and downsides of audiophile addiction – the ridiculous financial excesses, the mystical woo, the obsessive behavior – seem to evaporate in the face of hearing music which you once thought you intimately knew, becomes an experience anew.